All women should read this! The Brave Art of Motherhood by Rachel Martin is simply amazing y’all! I have read a lot of good books but there have only been 2 that I would classify as life changing for me and this is one of them! You don’t even have to be a mom to get help from what Rachel shared in these pages. I have followed her blog for a couple of years and have always loved her style of writing. It’s like she’s having a genuine, authentic conversation with you. This book is the same way. She shares a raw emotion that resonates with so many women and I found myself feeling like she was literally writing about my life in some parts of the book. It’s so much more than just a bunch of inspirational quotes to make you feel good for a short time. She discusses how we get stuck in patterns that start all the way back in our childhood and exposes the excuses we make to justify staying in those patterns. Then she teaches how to break the cycle and gives you the tools needed to build your confidence. From the beginning where she bravely bares the hard, ugly parts of her past, to the practical action steps she provides to break free from the harmful cycles we find ourselves stuck in, Rachel has filled this book with good stuff from cover to cover! This is one that I will read and reference over and over again! 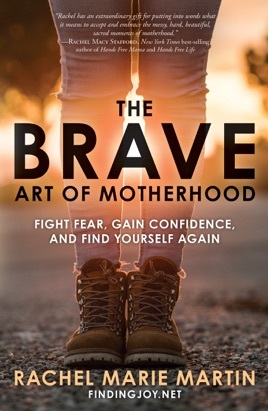 Rachel Martin is a promoter of change and reclaiming yourself as a mother and woman in her new book, The Brave Art of Motherhood. As a full-time mother, blogger, author and entrepreneur, she understands how hard change can be. Yet through her own struggles, self reflection and encouragement from others, she has learned that you can fight the fear of excuses, to break the cycle of being stuck and wants mothers everywhere to know they can too. This book challenges you to find the courage to say yes to your dreams and find yourself in the midst of motherhood.